Several great names immediately spring to mind when it comes to the manufacturing of diecast vehicles: Dinky, Corgi and Matchbox are the obvious choices. 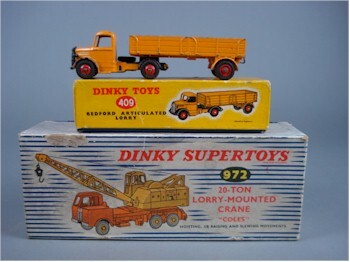 Dinky Toys first appeared in 1934. They were produced by Mecanno Limited - the firm founded by Frank Hornby in 1901. Dinky Toys were designed to compliment the Hornby railway system but soon grew into their own recognised brand. Saloon cars made way for delivery vans, lorries, road making equipment and military vehicles. Originally sold unboxed, they were eventually wrapped in corporate boxes. The auction price of a Dinky toy can quite literally double if it has its original box. A Dinky diecast articulated Bedford lorry and a Coles Crane. Corgi Toys were produced by a firm called Mettoy and first appeared in direct competition to Dinky in July 1956. Their models differed from Dinky in that they included plastic glazing and later jewelled headlights, which lent to greater authenticity. Some of their more famous models reflected either TV or film themes and included a Batmobile, Chitty Chitty Bang Bang, James Bond’s Aston Martin and other such classics. Matchbox were a brand of diecasts produced by Lesney, and one of their most popular ranges was the 1-75 Series of diecasts sold in boxes similar in size to matchboxes. Called initially Lesney Moko, they eventually became known as Matchbox Superfast and are still sold in matchbox size boxes. Matchbox also produced a range of vintage cars under Models of Yesteryear, which have been produced in five series or issues. Each series is numbered from Y-1 onwards so it is important to know not only the Y number but also which issue it is. Continental rivals include Solido, Brumm, Marklin Polistil and Burago.